Every year, the City's department of Engineering and Public Works sponsors this charitable effort to assist families at Christmas time. Christmas is a special time of year for these volunteers, and they believe that every child in the community should have gifts for Christmas. 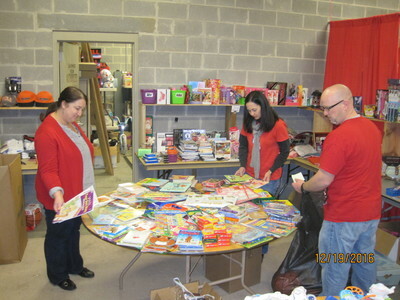 Employees work year round working with local businesses and collecting donations to assist families in need who are not assisted by other organizations. Back in 1982, an employee started handing out candy to children along his daily routes to spread Christmas cheer. What started with one employee 35 years ago has grown over the years - with the event now helping up to 800 families annually. We serve families with infants and children up to age 15. We need toys for small children, bikes, fishing poles, sports equipment, and especially items that are geared to middle school girls and boys ages 10-15. Please do not wrap the toys - we try to be equitable to siblings, and we need to see what the gift is. Toys will be distributed at Santa's workshop for three days before Christmas - December 19 - 21, 2018 from 9 a.m. to 4 p.m.
​Toys and gift distribution is for children newborn to 15 years old. No other assistance has been provided by other agencies. We link with United Way and other charitable agencies. Families may be assisted by only one organization for Christmas gifts. Bring a proof of residence in Blount County (utility bills) and proof of guardianship of child/ children. If you need an ID for your child, you can visit the Knoxville Social Security office at 8530 Kingston Pike; phone 1-866-331-9091. Office hours are from 9:00 a.m. to 3:00 p.m. Monday, Tuesday, Thursday and Friday and from 9:00 a.m. – 12:00 noon on Wednesday. (There is no Social Security office in Maryville.) An ID will be needed to request social security card for child. Bring a school ID, recent verified immunization record, insurance card or some form of valid ID. The card will come within 6-10 days. 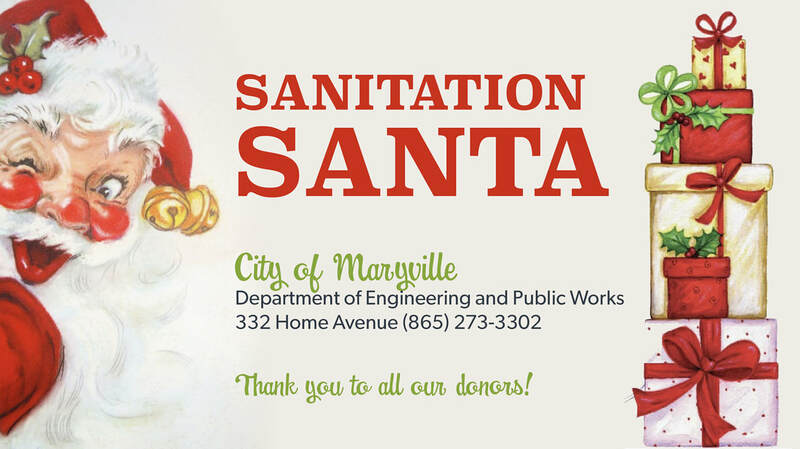 There are several ways for citizens to get involved with Sanitation Santa! 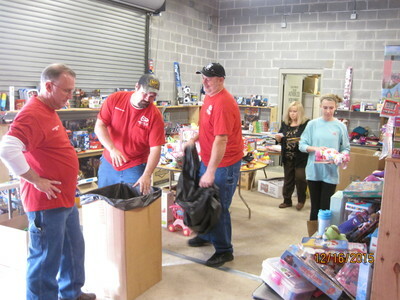 Toys - Year round contact 273-3302 or drop off at Maryville Operations Center 332 Home Avenue. 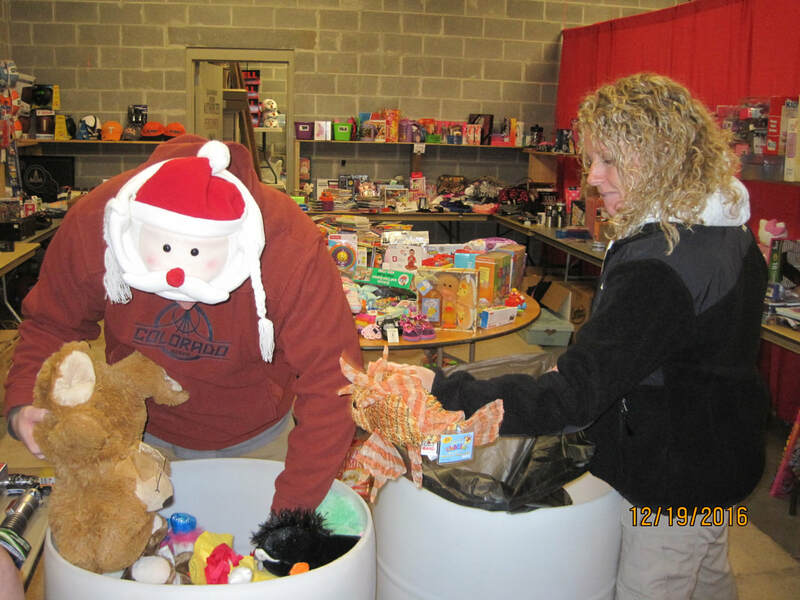 During the Christmas season, toy boxes will be placed in the main lobbies at both Maryville Operations Center, 332 Home Avenue or at the Maryville Municipal Center, 400 West Broadway. Cleaning Out? We accept very clean, gently used toys and games in working order that can be loved again by more kids. We accept donations year round. We can pick up or they can be dropped off at the Operations Center - 332 Home Avenue. Christmas trees with suggested gifts are located at the entrance of the Alcoa Walmart. The community is invited to help purchase toys for Blount County kids in need. Items like board games, footballs, dolls, art supplies, etc. are all great donations for Sanitation Santa's workshop. Become a Sponsor - We couldn't do this without our corporate and local business sponsors. If you would like to donate funds or have one of our toy boxes for your employees to fill with toy donations, please contact us! City of Maryville Tree Lighting - First Monday in December at 6:00 p.m. on the front lawn of the Municipal Building at 400 W. Broadway Ave.
Visit with Santa, get your picture made, and enjoy some festive entertainment. You can also drop off a toy for the Sanitation Santa program while you are here. If you would like to donate coats for this program, they can be dropped off at the Maryville Fire Department or Blount County Fire Department Locations. Coats will be available for distribution at Santa's workshop during the Sanitation Santa distribution dates.